When it comes to residential plumbing services, not all companies can meet the high standards of homeowners in the Greensboro area. 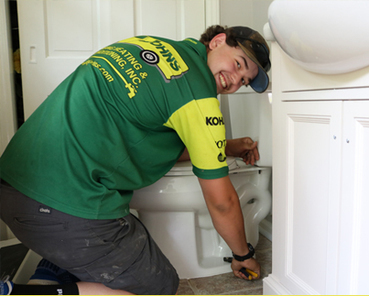 We have built a reputation for ourselves as commercial plumbers, and we bring that experience and expertise to residential plumbing systems throughout the Triad area. From new home construction to entire kitchen or bath remodels—and everything in between—it’s important to get your plumbing right the first time, with qualified professionals who are on standby 24 hours a day, 7 days a week. Along with the installation of all brands of basic kitchen plumbing and fixtures, we can also install and repair garbage disposals, dishwashers, and water purification systems for cleaner, better-tasting water. Need drain cleaning? We can do that too! If your dish water isn’t getting hot enough, it may be time to contact us about installing a new Rinnai tankless water heater. Remodeling or renovating? Leave your new bathroom plumbing installation to the pros. We can help you create a relaxing spa of your dreams with bathroom faucet installation and plumbing repair. Don’t worry about plumbing emergencies -- we have you covered 24/7 with our around-the-clock answering service. If your pipes are draining a little slowly, we can help with drain cleaning or video-camera locating if something has fallen or become trapped. Are you noticing that your laundry isn’t getting as clean as it should be? Is there a foul odor coming from your washing machine or utility sink faucet? Talk to us about your water purification and softening needs to help get your laundry cleaner and fresher-smelling. Our residential plumbing pros will also install plumbing for washing machines or repair water lines that may have frozen or burst. Here’s another part of the house where you may notice your old water heater isn’t keeping up. Sometimes the plumbing emergencies happen outside of your house, and we can help with that too. We can repair and replace sewer and water lines, help with your sump pump or well pump, and repair all brands of outdoor faucets. Need help with backflow prevention and testing? Get in touch—our pros can help. If you’re looking to save money on your utility bills and make your home more energy efficient, contact our residential plumbing experts about installing and servicing solar water heaters or tankless water heaters. These “green” features can also add value to your home. Our residential plumbing professionals use only high-end materials and offer a one-year warranty on work. Johns also offers customized warranties to residential customers based on the project. Johns residential plumbers can become your one-stop partner, offering traditional plumbing services along with extensive experience and knowledge about heating and air conditioning systems, and water purification and softener system installation and maintenance. Our knowledgeable technicians are ready to assist you with any of your requests. Call (336) 294-2301 or fill out our form and we’ll be in touch! "We called Johns Plumbing and WOW! A truck was dispatched and was at our location in less than an hour - this is true customer service! I can not tell you enough how professional and knowledgeable the two men were. They diagnosed the real problem, which turned out to be something entirely different than what my son and I thought it was. The men were hard working and got me diagnosed and repaired in short order. They showed respect for the cleanliness of my property, were pleasant easy to talk to, and did a great repair. Johns Plumbing will be who I will continue to use when the need arises and I will recommend Johns whenever I can."